The cursor is at the wrong end of the line of text, it’s all justified to the right, it shows oddly as you type, and editing it is a nightmare. So how do we change the orientation of the comment text? What we want to do is change the comment box text from wanting to run right to left to making it want to run left to right. And the easiest way I’ve found to do this is to add a secret little button to your Quick Access Toolbar, then use that to sort out your text. 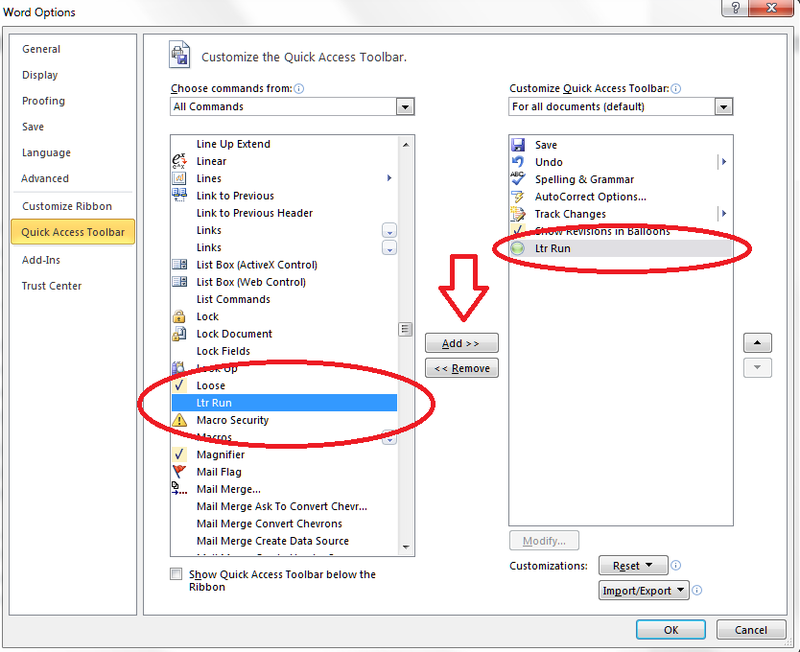 Go to my article on how to add buttons to the Quick Access Toolbar if you need a refresher (or note that you click the down arrow on the QAT at the top of your screen then choose More Commands). When you get to the part on the Customize Screen menu where you choose the button to add, type L to get near the right place and/or scroll down until you come to Left-to-Right Text Direction and add that to the Quick Access Toolbar. Please note: you will have to do this for each comment box you create. But it’s only a matter of pressing one additional button, and it WORKS reliably, where fiddling around with the Styles really won’t always work (I know: I’ve been there). Now, this works just the same in Word 2010, apart from the fact that the button has a different name and a different appearance! Of course! 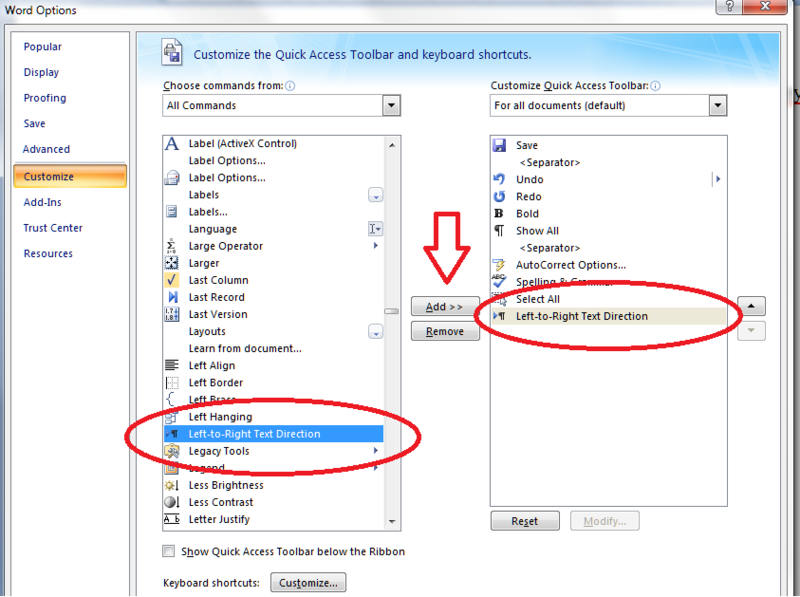 So when you have reminded yourself how to add buttons to the Quick Access Toolbar if you need a refresher (or note that you click the down arrow on the QAT at the top of your screen then choose More Commands), you will need to start by typing an L and/or scrolling down, but this time you’re looking for Ltr Run. Again, please note: you will have to do this for each comment balloon you create. But it’s only a matter of pressing one additional button, and does WORK reliably, where fiddling around with the Styles really won’t always work (I know: I’ve been there in Word 2010, too). And if you’re using a Mac? Well, apparently you can’t do it, and will need to send it to a friend with a PC. But if you know better, do let me know! It’s always worth trying copying and pasting your text into a new document. And if that doesn’t work, here are two more methods to try. This will make a little dialogue box come up. Click on the top A button (marked with an arrow) and the Paragraph Formatting box should change to Normal. We also found this more drastic way. Thanks to Mr. Libro for finding this workaround. You can just go back to the list each time. Watch out – your place in the list may well jump around and you may have to scroll up or down to find your style. And then press OK until you’re back at your document. All of your comment boxes will now be the correct way around. Want even more detail on how to customise your comment boxes? Read my article on customsing comment boxes! 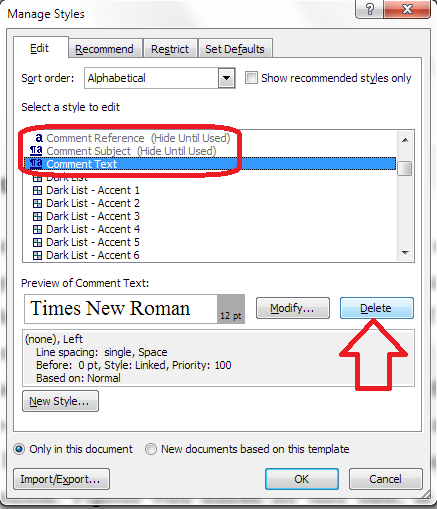 Related posts: What to do if my comment boxes go tiny in Word. I know of an even simpler way. First copy all the text with tracks off. Open a new document. Insert a comment and type in something in the comment box. Hit enter. Paste your text. Voila, all your comments are ‘normal’ again! Thanks for your comment. I have tried that way and it sometimes works … whereas this one always does (so far!). So it’s certainly one people can try. Venkitachalam’s method doesn’t work. Not clear what you mean by “all the text” (the entire contents of the document? – Why would I want to paste that into a comment balloon? ), but I did it both for all the text (got all the text in a comment balloon – great) and for a reversed comment (got the reversed text in a left-to-right comment balloon – not very useful). Is there something I’m missing? Could you please give more detail about how to do your method? Hi there, David. Have you tried the method outlined in my blog post, which I know works reliably as I use it all the time? Krishna’s method works on the principle of opening a whole new document, leaving it empty while you create one comment box, which will be by default the right way around, then copying and pasting your main document text into the body of the new, blank document. But I have not found that to be reliable. My way works on a PC. If you are on a Mac, you cannot do that, apparently. One solution is to find a friend with a PC, get them to do my procedure and send it back to you. This has worked for a friend. Thanks alot. I met this kind of problem long time ago and have no clue how to solve it until I read your article. Thanks Liz. I had the same problem with a large document I am editing. The text is English but the comment box language is Arabic. I have tried changing the language but you have to do it for every Comment and change the formatting. Into the ‘Too Hard Box’! Your method adds a button, but it works every time! You are a gem! Much appreciated. Hi there and thank you for your comment. I hope you see this OK. I can’t amend your notifications myself – the system will not let me do that. Next time you get a notification, you will have a link at the bottom saying “manage subscriptions”. Click that and you’ll get a list of all your WordPress subscriptions. You’ve probably subscribed to my blog, and comments on the blog, and replies to your comment on this post. Delete the extra ones and you’ll receive one notification per comment, or per blog post, whatever you want. What about in Word 2003? I have the same problem. Hi Kristin, I’m just checking this with someone who has Word 2003 – watch this space! Let me know if you find a good solution. My workaround was to copy the text and “Paste Special” using the Unformatted style to a new document. Of course, then I had to reformat everything else, but that was worth it to resolve the problem. 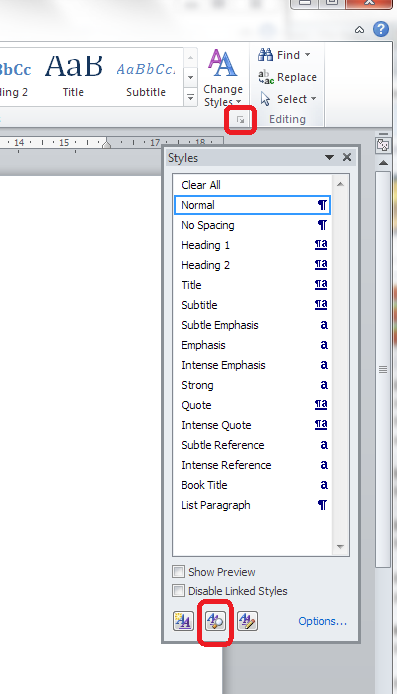 Format->Paragraph in Word 2003. Under General-> Alignment, change it from Left to Right. 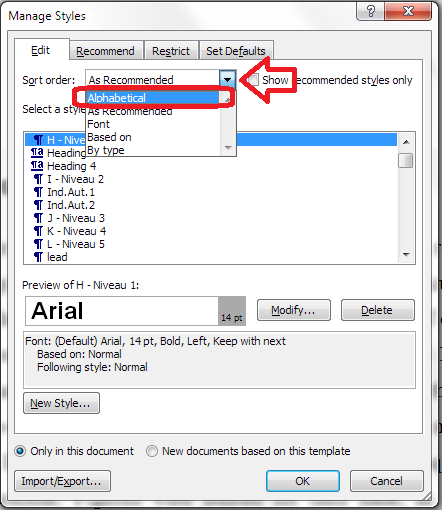 In Word 2003 this seems to work to add the icon …. Left click on the icon to the left of the command and drag it to the desired menu bar location. Once the “Customize” box has appeared and you have selected the “General” tab. Choose “Format” in the left hand column and then from the right-hand list, you can choose “left to right” and “right to left”. I appreciate that you investigated this. The solution that you posted doesn’t entirely solve the problem for me though I know it will be helpful for many who google this problem. In my case, the text now appears left aligned, but when I add field codes, or try to use the comments in Track Changes, those appear left-aligned but still reading right to left. There must be some kind of glitch in my program because everything is indicating that it should be fixed. So it works for the text but not the comments, is that right? … let me investigate further … there WILL be a solution! It works for the text, but not the comments or the Endnote references that I’ve inserted. Somehow Endnote and Word aren’t playing nicely… The Endnote references switch to left aligned by doing what you wrote, but the numbering is still on the right! 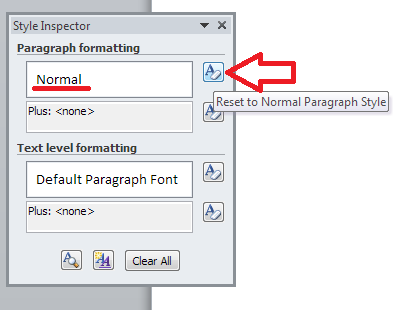 The toolbar button in Word 2003 sort of fixes the problem, but you have to click it every time you make a comment and it reverts to right-to-left when the text wraps to another line. Quite frustrating and confusing. Been using this method over six months and have no problem at all. I’m using for a manuscript right now that is from Egypt and came here just to say thank you!! Thanks for your comment, Naz, and I’m so glad I’ve been able to help! Just desired to stress Now i’m thankful that i came on the web page! The problem with the solution above is that it requires you to do the same for each and every comment box you may wish to add. A far simpler way is to change the language of the Comment Text style so that it applies to the whole document. Because I am using Word for Mac 2011, I can only give the exact menu item names from my system, but Windows versions should follow roughly the same logic. 1. 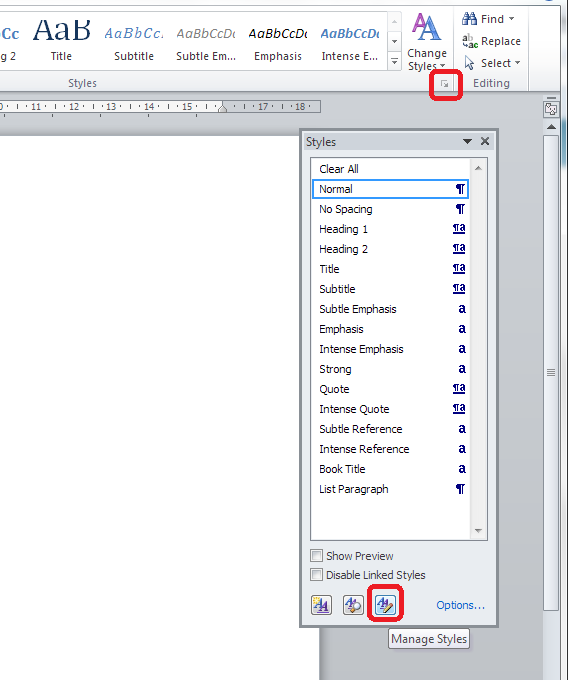 In the Styles section of the Home tab, click the icon Manage the styles that are used in this document. The Styles pane appears. 2. From the List drop-down list, select All Styles. 3. 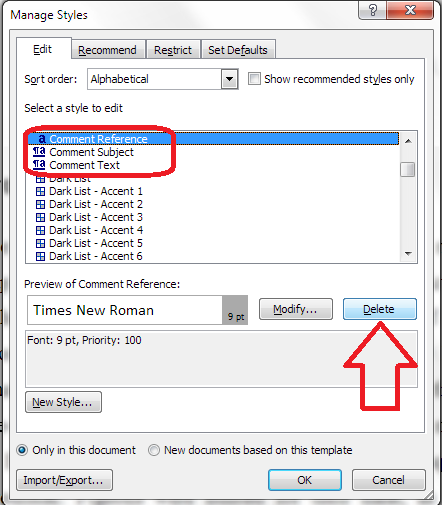 In the list, find Comment Text, click the arrow next to it, and select Modify Style…. 4. From the Format drop-down list, select Language…. 5. Select English (US) or English (UK), and click OK.
6. Click OK to close the Modify Style dialog. Thank you for your comment. In fact, in Word for Windows this does change all of the boxes from then onwards, but thank you for the Mac instructions. With your permission (and with a credit) I would like to add these to the main body of the article. I’ve been trying this but it appears to already be in English(US). I can make changes to the style of individual comment boxes by applying paragraph style, but it doesn’t change it for the whole document…and punctuation and arrow keys still behave backwards. Thanks for your comment, Aaron. First off, the language of the comment boxes will be in whatever you expect it to be (UK English in my case), that’s what always seems so confusing. The only way to remedy this is to do what I set down in this post, i.e. get the LTR button on your Quick Access Toolbar and click it with the cursor in your comment balloons. Unless you’re on a Mac, in which case the only option is to send it to a friend with a PC! I hope that helps, let me know how you get on. Hi thanks. This actually works for Word2010. Thank you for your comment. If you look at my resource guide, you will notice that I have lots of resources building up on blogging, with more to come. I hope that helps! Thanks you. I followed your clear directions on changing text direction and my frustration level dropped significantly. Thank you for your comment. So glad I could help and reduce your frustration! I’m struggling with right-to-left text in comment ballons. I’ve followed Liz’s instructions and have added the green ‘Ltr Run’ button to the QAT but I can’t get it to work. What am I missing? Help, please… I’m using Word 2010. Thanks for you comment, Jane. If you click in the offending comment box so your cursor is in there, then click on the button, the comment box direction will change. Hope that helps! Liz, it really does not work for me. Honest! Do you think there is something I could try somewhere in styles? It’s a journal paper originating from Egypt. OK, two further options. 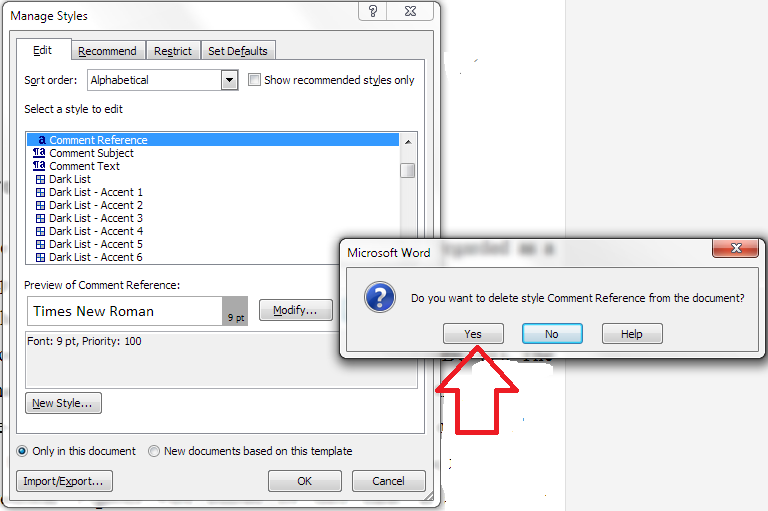 Have you tried select all and pasting it into a totally new document? If that fails, send it to me using liz AT libroediting DOT com and I’ll have a look for you. Just a quick update, I’ve found a way (thanks to Matthew, Mr Libro) and have emailed Janet and added an “… if that doesn’t work …” section above. Hope that helps everyone! Liz, I’m happy to report that your method for changing Styles in comment boxes back to Normal works brilliantly. Hurrah! And it’s really not too much trouble to use for each new comment because you can just leave the little Style inspector box open at the side of the document and then it only needs one extra click for a new comment. Thank you so much, my sanity is saved! That’s wonderful news – thanks for reporting back! Phew! You’re welcome – so glad I could help! Hi Liz, do you know how to fix comment boxes that do not show all the text? There is a small icon in the bottom right corner of the comment boxes that shows there is extra text not showing. It shows the whole of the text in the comments panel however. The comments are not even long, only a few lines. Hi Audrey, that’s an interesting one! Is it the case that there are lots of comments boxes so it’s doing this in order to fit in all of the ones that are needed on a page? If so, you could try increasing the margin of the comment area, which would give the boxes more room. Let me know if it’s not that, though. Thank you for this great post. Editing the styles is a more practical solution and it worked for all comments. Thanks for the tip! Hi Benjamin, thank you so much for the update for Mac, which I know my readers will find really useful! Thanks Liz, I have been really struggling to edit a dual language Arabic/English legal documnet, and this has saved me! I will check your blog next time I get stuck first! From one editor to another—thank you so much! Your tip just saved me a ton of time fiddling with comments and styles. You’re welcome – and always extra glad to help fellow editors! I am so so so grateful to you for this article! I have spent the last couple of hours trying to solve this problem, and I was getting so frustrated! I finally found this article and my day is saved!!!! So glad to be able to help – it makes my day when I get messages like yours! Somehow, none of these worked for me on a comment I tried to make as I reviewed a document originating from a Hebrew-speaking author in Word 2010. I had already made many tracked changes, which didn’t seem to carry over if I copied the abstract text into a new document, so I settled for typing the text for the comment in a new document, then copying that into the comment box. I can’t imagine why Hebrew would behave differently in this instance than Arabic, so maybe something else was wrong? Fortunately it was only 1 comment, and I will have to remember to copy and paste into a new document *before* I start editing the next time. Anyway, thank you for such a thorough explanation! thank you so much, I managed to follow your instructions on aligning text left to right. My comments box was aligning right to left weirdly. I’m glad I was able to help you!